Diario Judío México - Social Classes are very defined in Mexico, so many times opportunity depends on what class you are born in. There is a woman in Tijuana who is determined to bring music into the lives of all children, no matter what their background is. When you first meet Alida Guajardo de Cervantes, you notice how refined she is. She is obviously a woman of means. However, unlike many Mexican women of a certain class, she also displays a rebellious streak and a steely determination to bring music and culture to the children of Tijuana. Alida was born in San Diego and raised in Mexicali. She has always been a cross-border person moving with ease between the two worlds. As a young woman, she loved sports and played a lot of tennis. She followed the traditional route for her generation and after school, married a successful lawyer, Fernando Cervantes Conde. They have two children and three grandchildren. They have been married for 48 years and have lived in Tijuana for 46 years as two years were spent in Mexico City. At first, Alida led a typical life of wife and mother, but in the back of her mind, she knew she wanted to do something useful and worthwhile to help others. 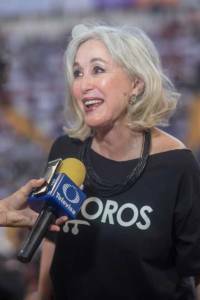 In 1992, she enlisted the financial help of Salomon and Maria Juana Cohen, founders of the department store, Dorian’s, in Tijuana. She wanted to find a way to bring some of the Mainly Mozart musicians to Tijuana to give concerts there, and they agreed to back her. Thus, the non-profit organization, Promotora de las Bellas Artes was born. Alida is the head, but receives no salary. Her work has always been on a voluntary basis. This organization has accomplished a lot in the last 26 years. First, they were able to arrange numerous Mainly Mozart classical music concerts in Tijuana, Ensenada and Mexicali. These concerts were for not only for private homes and CECUT [Centro Cultural de Tijuana], but also for the general public as Alida was able to raise money to bring low priced Mainly Mozart concerts to those who might not be able to afford a ticket. Another goal was to introduce the children of lower income neighborhoods in Tijuana to classical music and the joys of music in general. To that end, she began to organize programs where Promotora Bellas Artes brought pantomimes to schools and they performed skits about the lives of Mozart, Beethoven, and Tchaikovsky, along with the music. They produced comic books. There were also concerts performed at the Palenque at Parque Morelos for working class families and their children. The more the children were exposed to the music and lives of classical composers, the more they loved it. Promotora had found creative ways of using music and movement to entertain the children as well as teach them, especially children of limited means whose families or schools might not have the resources to provide these types of activities. The next idea they came up with was to have a sculpture contest. The contest was open to all and was based on imagination, materials and ingenuity. They started with 11 schools. Today, Promotora works with 24 permanent schools and 60 rotating ones. In the fall, Promotora brings the pantomime programs to the schools, in the winter, they have the sculpture contests, and in the spring, they present didactic concerts. They have implemented, “Mi Festival en tu Comunidad”, “Manos a la Obra” and finally, “Coros Escolares” or school choirs. In fact, one of the most successful endeavors they started year round was those school choirs. The choirs have impacted the children in many positive ways. They have provided a way for children of different backgrounds to come together and work towards a common goal. They have inspired and motivated many children to explore the arts by giving them more exposure by going into the classrooms. Alida gave me the example of a young teen that slouched and was both shy and defiant as she lacked confidence in herself. After participating for awhile, she was chosen to give a presentation and when she went up to the microphone, she was like a different person, standing up straight and speaking confidently. In addition, their choir programs have grown to three different types. 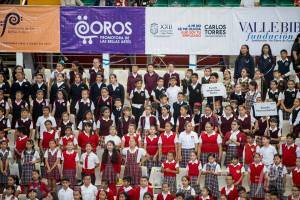 First, there are the “Coros Escolares” or school choirs. Next, there is the “Fundacion Valle Bibb” which is a newer sponsored program that also includes homeless shelters and orphanages. Finally, there is “Coro de Seleccion” or select choir. This is a choir for the more accomplished singers that was started in 2016 by master teacher, Salvador Cortes Juarez. In January 2018, Daria Abreu Feraud took over and now leads this master choir. This is the choir that has performed with several well known musicians and this is also the choir that enters competitions. In July 2018, they performed with singer/musician Sharon Katz and The Peace Train of South Africa in a show called, “Transcending Barriers”. Next year, ten students from San Diego, ten from Tijuana and ten from South Africa will go to Santiago de Cuba with Katz and the Peace Train to participate and perform in the International Choir Festival there called, “El Festival International de Coros de Santiago de Cuba”. Promotora is hoping to raise funds to see if they can send more students from their choir as it will be a once in a lifetime experience. What started as a desire to help the underprivileged children of Tijuana has grown into a large, thriving, multidimensional organization that has touched the lives of many. Alida Guajardo de Cervantes has many reasons to feel proud. For more information or to donate to this very worthy non-profit, the website is promotoradelasbellasartes.org.